We want to thank you for voting! 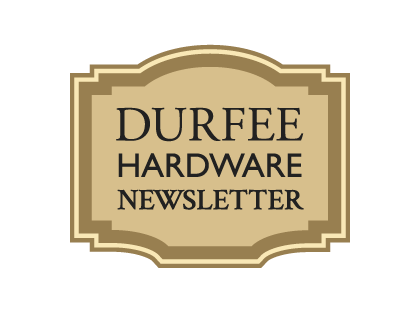 Durfee Hardware won the Providence Journal’s Readers’ Choice Award this year for the best hardware store! When I walk into the hardware store, it’s not simply getting something I need; it takes me back to an earlier time. I know everything seems better when you look back, but I do remember a lot more people walking instead of driving, and saying “good morning” as you passed. Maybe it wasn’t a simpler time, but it was a slower time. People talked to strangers a little more (and weren’t looking at their cell phones all the time). Some people have even mentioned that Durfee’s is as much a museum as it is a hardware store. Examples of that are up on the walls above the shelves. You can see the all-wooden snow shovel, and the original C. L. Durfee wooden sign hanging inside (after 85 years we thought we’d protect it from the elements). I’m not sure people know just how true Durfee’s “being a museum” really is. When the Whitney Museum of American Art opened in NYC, I saw exhibits that reminded me of the hardware store. That may sound strange, but they had an exhibit that had Hoover vacuum cleaners under glass. They also had one with “Markel” electric heaters under glass. Both of these we sold at the store in the 70’s and 80’s. I didn’t realize when I was arranging the appliances in the store that I was actually an artist. I’m including a link to an article below that describes the work of Jeff Koons, an artist inspired by Marcel Duchamp. There is a picture of the vacuum cleaner piece. Interestingly, while Duchamp was a contemporary of my father’s, I can just hear what my conservative, old Yankee, depression era Dad would say about heaters and vacuums being art (probably nothing complementary). Most of the work I have been doing has been on my front porch; I’m currently replacing the railings. The original porch (30 years old or so) rotted away where the screws were “toed in” to hold the rail to the post. The water got in there and rotted it away. I’m spending the time to make little wooden brackets so that no screws will be open to the rain. While this is taking a lot of time to do, I’m hoping it means that this railing will last through my lifetime at least. I’m also caulking the pieces as I put them together to avoid having water get into the joints. Again, I’ll point out that professionals don’t necessarily do a better job than you can. They do it in a manner that makes them money. Often, if you are willing to put in some extra time you can do a better job.